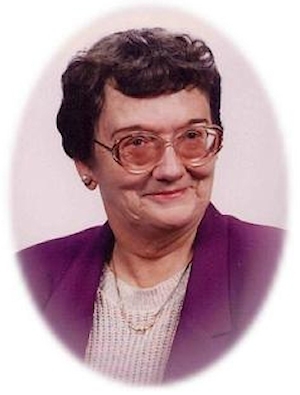 Obituary – Beier, Cleva Jo (Howard) « Perry High School Alumni Association, Inc.
Cleva Jo Beier, 81, of Perry, Oklahoma was the daughter of Dewey Lee and Ena May Humphrey Howard. She was born September 1, 1927 at Perry, Oklahoma and died Thursday, March 12, 2009 at Perry Memorial Hospital. On September 29, 1946, she and Edward J. Beier were married in the home of her parents near Perry, Oklahoma. Cleva Jo and her husband lived northeast of Perry, where they had a farming and ranching operation. She was a member of Zion Lutheran Church. For many years, she was a member of the Black Bear Homemakers Club and had served as president for several years. For over 16 years, she served as judge for Election Precinct 304 located at Sumner. Funeral services will be at 10:00 a.m. Saturday, March 14, 2009 at the Zion Lutheran Church, east of Perry. Interment will be in Grace Hill Cemetery at Perry. Services are under the direction of Brown-Dugger Funeral Home. Memorials may be made to Zion Lutheran Church in care of Brown-Dugger Funeral Home, 1010 N. 7th Street, Perry, Oklahoma 73077. Cleva Jo is survived by one daughter, Eddetta Grant and her husband, Chris, of Sand Springs, Oklahoma; two sons, Robert L. Beier and David E. Beier, both of Perry, Oklahoma; one granddaughter, Carrie Brown and her husband, Adam, of Perry, Oklahoma; four sisters-in-law, Lorene Loveless and her husband, Harold, and Leona Rice, all of Perry, Oklahoma; Marlene Oltmanns and her husband, Karl, of Stillwater, Oklahoma; and Carol Fuxa and her husband, John, of Weatherford, Texas; and two brothers-in-law, Arnold Beier and his wife, Eunice, of Clifton, Kansas and Roy E. Jones of Edmond, Oklahoma. In addition to her husband, Edward J. Beier; she was preceded in death by one grandson, Lee Dewey Beier; and her parents, Dewey and Ena May Howard.